What does it mean to chase the price down? For a home seller it means reducing the listing price again and again, but each time they are just behind the market trend, and instead of being on the front edge and getting their home sold, they are behind a market pull back every time they reduce their listing price. Here this description in more detail in this audio. If you are in a market where the market has topped out and is beginning to pause and begin a downward trend, you need to get your listing price right or you could end up chasing the price down and ultimately lose a lot of money. How important is sellability and appreciation in your home? Extremely important, and I’ll tell you why. Too many widows in their 80s have been left with a home they cannot sell, and it becomes a nightmare for them when they are struggling to maintain the property and pay property taxes. I’ll explain what has happened to many couples who built or bought a home that was not sellable 15 to 20 years later. You have to assume that you will “age out” of your home (probably in your 80s or 90s), and logically you will need to sell it when you get old. In order to sell your home in the future, there are two critically important things that must happen, and whether they happen or do not happen depends on the decision you make today about the home you buy. Before you will ever see any appreciation, you must be able to sell the home you will live in for the next 15+ years. So when you buy a home, you need to carefully consider how sellable it will be down the road. This is no small matter, and many people have screwed this up. That’s why I’m writing about this now–to help you as a buyer think this through so that 15 to 20 years from now, the sale of your home will go smoothly. Many couples built or bought their idea of the perfect home, but 15 to 20 years later they were unable to sell that home when their husbands either had health issues or predeceased the wife. [More often than not, it is the husband’s health that fails first.] A non-traditional floor plan is predictably hard to sell. A more traditional floor plan is not so hard to sell. Weird or too unique is hard to sell. A single level, 3 bedroom, 2 bath home between 1,800 and 2,400 square feet with an open floor plan (kitchen, living room, and dining room) is very sellable and is appealing to the vast majority of buyers, which makes it fairly sellable 15 to 20 years from now. You don’t have to buy a home exactly like I’m describing, but you get the point. There is a Bell Curve of normal homes, and as you get further out on that Bell Curve, the homes become less sellable. If you cannot sell a home when you are old, you will never see any appreciation, and the financial strain and the stress it would cause in your life would be a potentially devastating nightmare. This is why buying a home now that is sellable two decades in the future is definitely in your best interest. Appreciation is important, but sellability is everything. Sequim home prices are fairly reasonable compared to many areas of the country. We are probably in the middle when it comes to the price of a three bedroom, two bath home. Here are three homes in three areas of the country from the cheapest homes prices to the most expensive home prices. 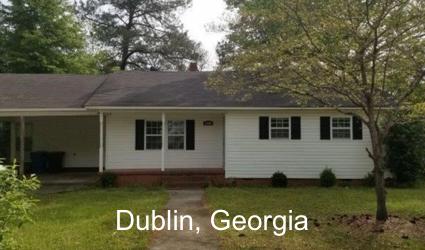 For $65,000, you could have this Dublin, Georgia home. The deep south has some areas where home prices are incredibly low. But as we say in real estate, “Location is everything.” Do you want to live in Georgia, or would you prefer an even climate in the Northwest like Sequim, Washington? 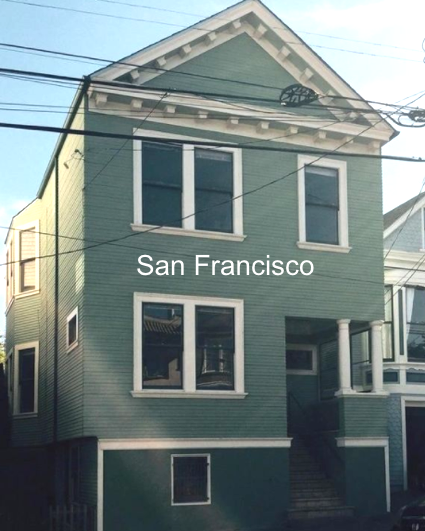 San Francisco is expensive, and this ugly home is $1,200,000. Egad! No thank you. Enough said about home prices in southern California. Alas, we’re back in Sequim, and I sold this home for $235,000. 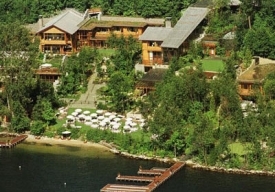 By the way, this home has a water view, which the others do not. So Sequim home prices are in the middle of the road compared to other markets across the country, but Sequim has what so many retirees want–a mild climate without temperature extremes, only 16 inches of rain per year (one-third that of Seattle), and extraordinary beauty in nature as Sequim is located between the gorgeous Olympic Mountains and the pristine Strait of Juan de Fuca. We’re probably lucky home prices in Sequim are not much higher. 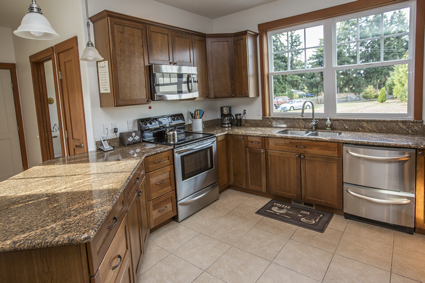 Our inventory has shrunk recently, but you can search the entire Sequim home MLS at this site at Sequim-Homes.com. The fair market value of home prices is determined by supply and demand. That is fundamental economics. But something unique is happening to Sequim and Port Angeles real estate prices that you may want to know. When supply decreases over a period of time and demand remains steady, prices will be pushed up. That’s logical, but there’s another implication that may surprise buyers. When you find the ideal home and want to make an offer on it, you will want to know what the fair market value is. The number one way to do that in any market is to examine comparable sales. Appraisers also look at the cost of replacement, and the county assessor has expensive software that estimates value, too. But once having done all that, and once you’ve come up with a reasonable fair market value based on the past six months of activity in the real estate market, if supply has been shrinking and demand has remained steady, which is the case in Sequim, what was fair market value a couple of months ago may no longer be fair market value today. In this case, the interplay of supply and demand can push fair market value up even though demand has not increased. Here’s a good example. A two year old, 3 bedroom, 2 bath home with 1,850 square feet in a nice neighborhood with a fair market value of $300,000 based on comps from the past six months has a higher fair market value today, because there are almost no houses left in the inventory like this one. There’s a point at which prices can be pushed above recent fair market value because the supply has dramatically dropped while buyer demand continues steady. That is exactly what is happening to one segment of the home inventory in Sequim and Port Angeles. When it comes to negotiating price, fair market value may be moving upward. Are real estate prices in the Sequim area at or near a bottom, and if so when will real estate prices start to increase? What kind of appreciation can we expect in Sequim? These are questions that buyers have been asking me as they plan to buy their retirement homes in or around Sequim. Most buyers are not concerned about whether they are buying precisely at the bottom of the market, because either this is the last home they will buy or they will live in it for 15 years or longer, so the bigger concern is appreciation. Real Estate Prices at the Bottom? We have a combination of unique circumstances affecting Sequim real estate prices right now, and for buyers it is the perfect scenario that we are not likely to see again. Let me explain. The Sequim real estate market is a small market, and prices move slowly and react slowly to economic forces like supply and demand. While prices have gone up substantially in many hot real estate markets around the country, especially in southern California, prices have not gone up commensurately in Sequim, and they should have simply based on the economic fundamentals of supply and demand. One of my buyers sold their home the first weekend they put it on the market in California, and they said real estate prices had increased 25% in the past six months in their market. They paid cash for a home in Sequim. Another buyer told me they had 34 bids on their California home, all above the listed price. I sold them a home in Sequim too, all cash. Sales in Sequim this calendar year have eclipsed sales in any year over the past seven years of the recession, yet prices in Sequim have not moved up the price curve. At least not yet, but that will change soon. Retirees moving to Sequim tend to have the same preferences, and they have been competing to buy homes in that small segment of this market. That means the supply of homes in that small segment has been shrinking. [Read The Sequim Real Estate Market is Bifurcated.] Since prices elsewhere have been increasing, more buyers have been arriving in Sequim to buy homes. It is a very simple supply and demand equation that insists that prices increase. But they have not gone up yet. When they do start to go up, it will be a very noticeable increase at first, and then beyond that a steady 3% per year appreciation in real estate prices. 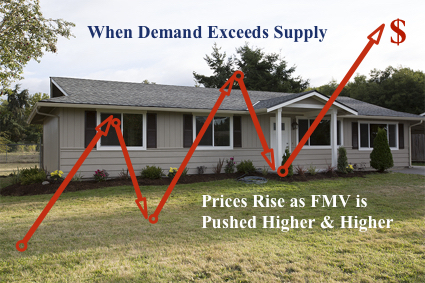 Just like the stock market jumps 5% when everyone finally realizes we are in recovery, real estate prices in Sequim will jump a little when prices finally respond to supply and demand. What does all this mean? It means that Sequim real estate prices are still dragging the bottom, but they are about to start increasing for the first time in seven years of depression. Exactly when will prices start to increase? I cannot say, but my guess is that it will happen in the next 12 months, perhaps after the turn of the new year or in the spring. Mark you calendar and watch the Sequim inventory for homes you like, and watch Sequim real estate prices. But if you intend to buy your retirement home here in the next few years, I think I would do what I could to buy earlier rather than later. Later will cost much more, at least in my humble opinion. That’s my take on Sequim real estate prices. What happens when a home is overpriced? A lot. The implications of having a home that is substantially overpriced in the MLS can be tragic. Here is what I have seen . . . more than once. A home was overpriced by almost 25%. In other words, it was listed in the MLS at a price that was above it’s fair market value (FMV) by 25%. How do I know this? History proved it. What happened to this home that was overpriced? The home was listed for almost a year before the owner and listing agent reduced the price, but they did not reduce it enough. It was still overpriced by 20%. Apparently both the seller and the listing agent did not understand it was overpriced, but here’s the thing. Buyers get very good at recognizing when a home is overpriced. After all, buyers spend months looking at hundreds of homes online, comparing features and prices, and then they spend days looking at their filtered list of homes comparing prices again. Sellers do not spend nearly the time or effort doing all this personal research, so it is no surprise that buyers are most often more in tune with home prices than sellers. At the end of the second year the house still had not sold. Because it was so overpriced, it had very few showings. The seller was frustrated, which is unquestionably an understatement. At the end of the third year the seller and the listing agent finally reduced the price to what it should have been three years earlier. The house did sell six months later, which was three and a half years from when it was first listed. During that time the market declined by 10% more than it had since this home was first listed. The seller dealt with a lot of stress for three and a half years. The listing agent was clearly as wrong as the seller about the original listing price and the subsequent reductions. But the consequences of being so wrong were tragic for the seller for this overpriced home. Are Listings Over Priced in Port Angeles and Sequim? Are homes for sale in Sequim and Port Angeles overpriced? This is a legitimate question. The answer is probably more accurately considered when you look at a particular home. In other words, while many homes are overpriced, many are not. Let me explain. I heard an interesting story this past weekend. A FSBO (for sale by owner) is trying to sell her home for just over $200,000. What’s interesting is that she started a year ago listing it with an agent at $299,000. As the story goes, nothing happened for many months until her agent came and said, “We need to reduce the price.” The owner was upset. She told her agent that she knew it was listed too high when she first listed it, but her agent listed it at $299,000. After this discussion they reduced the listing price to $269,000, which after many months proved to be too high again. Hence, the current FSBO for just over $200,000. I have a five acre, one bedroom home listed for sale at $225,000. The owner lost his job and has moved, and this is going to have to be a short sale, meaning the sales price will be less than the balance owed to the bank. The balance owed is about $256,000. Any sale will be subject to the bank’s approval, of course. Here’s my point about this listing. When my client first called me to discuss listing this home, he asked me what I thought it should be listed at. I gave it some thought and told him I thought a realistic selling price would be $225,000. He said he agreed, but that the other agent he had interviewed had told him $325,000. In his own words, he said, “I knew that agent was nuts when she quoted me $325,000 in THIS market.” Had she listed that house, it would have been $100,000 overpriced. Wow! On the other hand, I sold a house recently for $251,000 cash, and it would have cost $350,000 to buy the land and build the same house. That home was listed with an agent. The listing price was very fair, and even below FMV, but that’s what it took to sell it. My buyer client got a steal, even in this market. Some houses are overpriced, some houses are fairly priced, and a few are underpriced right now. If you’re from out of town, I strongly urge you to work with an agent who has been around for a while and has the experience to differentiate prices for you. You don’t want to pay too much for a home in this market. Here’s a quick comparison of real estate prices in Arizona and Washington. Heading north to the Northern Olympic Peninsula in Clallam County, here’s a vignette of prices of homes sold in 2006 and thus far in 2008. Clearly the prices in the Northwest have not crashed as in some other areas. On one hand this is good news for sellers up north, but good news in this market is often a scintilla of anything positive. The reality is that homes are still not selling in a reasonable period of time, such as 90 days, even at reduced prices. Until the market begins to show signs of coming back in areas like Arizona and California, the market in Clallam County Washington won’t come back strong either. The majority of buyers of homes and land in Sequim, Washington come from from the I-5 corridor to the south. What is the Sequim average listing price? What is the current inventory? Here’s a great graphic answering those questions. One short coming is that the Trulia database does not include the entire Olympic Listing Service database of listings, but it is still useful. You can also search the Trulia database for Sequim homes for sale. Drag your mouse over the line on the chart to see the actual listing prices. The inventory of Sequim homes for sale and Port Angeles homes for sale is high, higher than it has been in recent memory for most of us. Price reductions are almost a common place event in our MLS listings. Is reducing price enough to sell? No, it’s not. 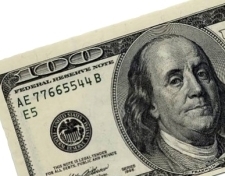 Reducing price and offering selling agents a bonus are motivational factors, but you could logically reduce the price of a listing every week and still not sell it until you were almost giving it away. So if price is not the only factor, or not the major factor right now for the majority of listings, why are listings not selling? The answer is simple. Buyers are not showing up. If buyers don’t show up, you can play with prices all day long and still get no results. Sellers now compete with a very small pool of qualified buyers. A seller has one property to sell, and there is only one unique buyer for that property. Finding the One is everything. Price is not. When that unique buyer finds the ideal property, will the buyer negotiate hard on the price? Absolutely. For the buyer price is clearly a major factor, but only after they have found the ideal property. Buyers know they have the advantage in a buyer’s market. But for sellers price is not the primary barrier to selling. The fact that buyers are not showing up is the major barrier. Is the Real Estate Market Bottom Here? Is the Sequim real estate market now at a bottom? This is the ultimate question. Sequim is largely dependent upon markets in California, Arizona, Oregon, and Texas believe it or not. Are these markets and the national market showing signs of bottoming out? If anyone needs hard evidence that the real estate market cycle is flattening out and turning around, check out the latest pending home sales index numbers. On a national basis, the index jumped by 5.3 percent last month. But more importantly, it rose in every region of the country, suggesting that the turnaround underway is broad-based — even if it’s likely to proceed slowly and modestly in the months immediately ahead. The index — which measures signed sale contracts that haven’t yet gone to closing — is a leading indicator of home sales for the coming two to three months. You can bet on solid increases in sales in the South, where the index was up by 9.3 percent, and in the West, up by 4.6 percent. Pending sales in the Northeast states were up by 3.4 percent and in the Midwest by 1.3 percent. These are good signs. Whether we are at the precise bottom or not, this is still a very good time for buyers to take advantage of low prices and the power they have to negotiate a great price. In my opinion, prices will not go lower, or they will not go significantly lower in Sequim. But when they do start to rise again, when the pent-up demand kicks in, prices will bounce upward, and any buyers hoping for a super price will be sadly disappointed. Sequim and Port Angeles real estate listings have seen some reductions in prices recently. Realtors love to use euphemisms. Just as a used car is a “pre-owned car,” so a price reduction is a “price improvement!” True from the buyer’s perspective, but certainly not from the seller’s perspective. In the last three months, there have been 298 properties (homes and land) in the Sequim area that have had the listing price reduced. In Port Angeles, 220 properties have had a price improvement. Here’s a graphic showing the reductions. In Sequim listed prices have been reduced in the past three months to about 90.39% of the orginal listed price, and in Port Angeles listed prices have been reduced to about 89.59% of the original listed price. 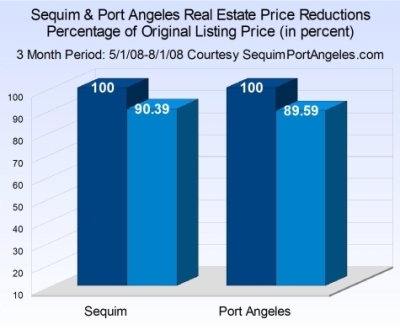 This represents an average price reduction of 9.61% for Sequim properties, and 10.41% for Port Angeles properties. These are significant reductions, but certainly not the 30% or more that cities like Las Vegas are experiencing. Still this is significant for our area. These numbers are meaningful, because anyone who has their home or land listed for sale must realize that they are not in the driver’s seat to bargain like they were in 2005. This is a buyer’s market. Sellers are not in control, at least not until the market begins to come back stronger. NOW, do you want to see some actual numbers? Below is a list of 167 listings that have been reduced in price, and I’ve only included the major buyer’s range from $200,000 up to $460,000. Look at the last column to see the actual dollar amount of the reductions. There are many $25,000 reductions, $40,000, $65,000, and up from there. I haven’t included the million dollar home price reductions, because the majority of the buyers are just not there. But if you’re thinking a $5,000 price reduction might move your house, think again. Many have reduced the price 10 times that amount and more. Read the rest of this post to see the full table of price reductions below. 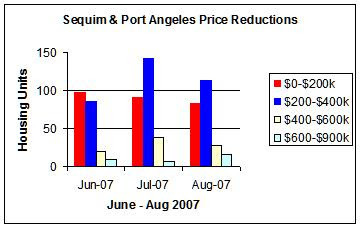 Price reductions for real estate listings in Sequim and Port Angeles in the month of June, 2008 are revealing. There were about 95 properties that were either sold for less than the listed price or are still listed for sale but had a price reduction. The average price reduction in June is 91%. [Source of Data: Olympic Listing Service]. This is valuable information, because it tells us where the market says prices are with respect to the listed prices. While each property is unique, whether you are buying or selling, it is good to know that prices have been generally reduced in the month of June by 9.0%. To view the entire data, view the rest of this post. 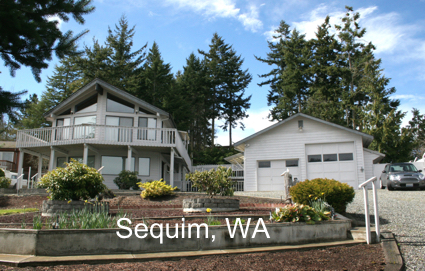 Sequim real estate prices are reasonable but not as low as some areas of the Midwest United States. I often receive email requests or telephone requests for a stick built home with 3 bedrooms, 2 baths, and a garage under $125,000. The average price of homes sold in Sequim in the first five months of this year was $324,450. I’ve talked with many builders in the area, and they all express the same sentiment. They cannot build a home and sell it for less than $279,000, and with a few upgrades most people want in their homes, that boosts the price of a new home to above $300,000. That’s pretty much rock bottom pricing. Most new homes, including the price of the land, site preparation, and home construction are $350,000 to $450,000. A significant number of retirees to the area are spending a total of $550,000 to $750,000 on land and construction. Those are not even luxury homes. Luxury homes are much higher. You can find an older stick built home for less, but you can’t replace it today at that price. Homes that are inhabitable and listed under $225,000 are gone. In a heartbeat. Here is some real data in the form of listings that you can view in the Sequim market for homes priced under $200,000. In fact, here is a complete list as of this date of all homes listed for sale in Sequim for $200,000 and under. There are only seven, and you can click on this link and view these listings. There maybe one in here that is ideal for you, and if there is, you can email me or call me. I’d be glad to either get you more information or show you this house at your convenience. These listings are best viewed in Internet Explorer, so if you are using Firefox, click on the link below but then switch to Internet Explorer if all your images are not showing correctly. The majority of sales in Sequim were in the price range of $200,000 to $350,000, and there were more single family homes sold in the higher price range than the lower price range. Over 50% of the houses sold are in three price ranges from $200,000 to $350,000–not a surprise. The more interesting statistic is that houses sold in 2007 in Sequim over the price of $400,000 accounted for only 27% of the market. Sellers with homes priced above $400,000 will only sell to 27% of the entire buyer population! That will have implications for how a home is priced and marketed from day one. This is another major reason that overpricing a home in the beginning kills almost all chances of connecting with a buyer right away. Many FSBO’s, and even many real estate agents, think that the best strategy to sell a home above $400,000 is to price the home high and leave room for negotiating downward, but this is actually a strategy that guarantees 73% of the buyers won’t even come to the table. It’s something to think about in this market. What has been happening with real estate prices in Sequim and Port Angeles recently? During the month of December, 2007, there were 72 price reductions for residential properties. Click on the image to enlarge it for viewing. These price reductions in December represent homes only, not lots and not multi-family units. The average 12% price reduction of these 72 properties represents a reduction in price from the original listing price (which would be months prior) and the current listed price by the end of December. This is good for buyers, and not so good for sellers. Look at the DOM or Days on Market. The average days these 72 homes were on the market without being sold was 158. Stay tuned for more on the local real estate market and prices. Wondering about the trend of Sequim real estate and Port Angeles real estate prices? Here is a vignette of the last three months showing the number of price reductions of listed properties in the Olympic Listing Service in four price categories. Not conclusive by any means, but instructive. Stay tuned for more valuable market stats.